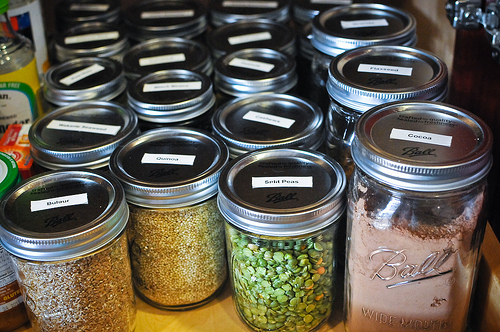 Most health food stores have a bulk bin section where you can get dry goods like beans, grains, flour, and even dried fruit in whatever quantity you want. Using these bins is both cost effective and eco friendly because it cuts down on all the extra packaging compared to buying things in boxes or bags. It’s also a really nice way to try just a little bit of certain ingredients. 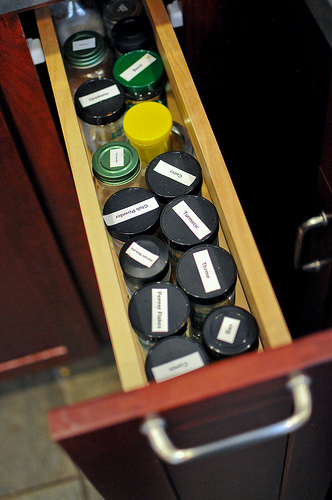 If you own a label maker you can just stick a label on the top or the front (or just use a sharpie if you don’t want to be quite so OCD about it) and then you have a beautiful little list of ingredients right in front of you every time you open the pantry. When I buy a new jar of whatever spice I just get the same brand and put the old lid on the new jar so I’m not making a million labels. 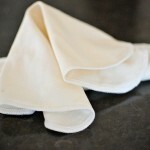 I just wanted to drop a quick note to say how much I love your blog! I came across it today via foodgawker (I think?) and have already read all of your posts. Keep it up! I love your Greener Every Week series, too. You have a ton of great tips and ideas, and I appreciate your sharing them. I just bought some mason jars and I’m ready to tackle the bulk isle. I’m kind of OCD about food shelf life so I was wondering, how long do grains, nuts, spicies, flours last one I buy them and jar them? And are there any that you suggest be refrigerated? I know some people refrigerated their flours. I do actually keep my flours in the freezer so they keep longer – everything else (nuts, rice, etc) I keep in jars in the pantry and most of it seems to last at least a few months. Love how organized this looks! My grains sit in that plastic bag in a plastic tote all thrown in there. I have a million ball jars for canning so this is perfect! Love the labels! Go go gadget P-Touch! 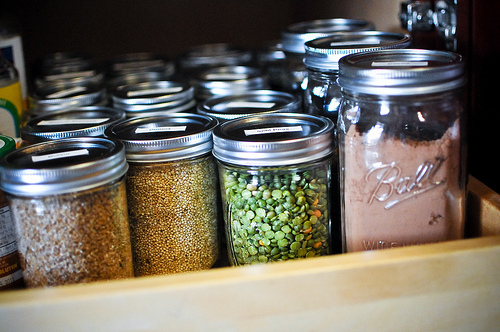 Those jars are so beautiful! I keep toying with the idea of jars and a label marker. The simplicity is great! I love this! For one of my MBA classes we have an Innovation Proposal project where we have to come up with a new and sustainable business idea. We’ve decided to do a 100% bulk grocery store where there are only reusable containers available for customers to store products in. This is exactly how I envisioned someone’s kitchen looking in our model. Simply awesome!